EDITORIAL NOTE (8/28/2018): This blog accurately reflects our opinions and thoughts at the time it was written. However, in 2018 Mr. Smith came forward to admit mistakes, correct the scientific record, and improve the understanding and practice of Citizen Science. Given the 2018 mea culpa, we want to note that Flintwaterstudy no longer has residual animus with Mr. Smith, Mr. Ruffalo and/or Water Defense. Identifying and admitting mistakes is one of the most important steps in cultivating the scientist within all of us—we strongly believe in giving people second chances. We also want to acknowledge Mr. Smith and his colleagues, for bravely reporting to the U.S. EPA and State of MI, their discovery of lead sinkers in plumbing of a Flint resident in 2017. This was an undeniable act of scientific integrity that should be applauded. Instead, some individuals persist in personally attacking Mr. Smith and his colleagues for doing the right thing, which we consider to be unfair and unethical. A coalition of Flint Citizens and scientists labored for almost 2 years to expose the Flint Water Disaster, and after a federal emergency was declared, the citizens, scientists, non-profits, EPA, CDC, the State of Michigan and FEMA were working together to solve problems. A month after the recovery was underway, actor Mark Ruffalo’s “nonprofit” WATER DEFENSE came to Flint, and immediately began to “discover” dangerous levels of contaminants that no one else could confirm. The results, which supposedly came from “independent certified labs,” were provided to residents, and alarmist videos were released about supposed dangers of bathing and showering in Detroit water (4 months after switching from the Flint River). We now reveal VIDEO RECORDINGS of Water Defense endorsed and/or coordinated SAMPLING EVENTS. These reveal why they are finding problems that no one else can. The videos you are about to see are for mature audiences only–some will find this content comedic, others will find it horrifying, and still others will find it tragic. The Water Defense coordinated sampling efforts create mountains of scary and useless data, after their improperly collected samples are submitted to “certified laboratories.” These reports have have been used to misinform and create unsubstantiated fear amongst unsuspecting members of the public in Flint and East Chicago. Water Defense’s 12-step program to collect samples purportedly showing dangerous levels of bacteria or other contaminants in water, results of which are then used to encourage use of over-priced and over-hyped filters that supposedly render the water safe. Find Lead AND “Bacterias” that others do not find. Use a knife to scrape “bacterial fungi”* from the outside of your basement sewer pipe. * “Bacterial fungi” is a new life form proposed by the Water Defense-TYT collaboration. If true, it is not only Nobel Prize worthy, but also WaterBug™ sponge worthy. Cap the already unsterile bottle. Whoops, dropped it on the floor? No worries… after all, the goal is to find bacteria no one else finds, and sampling the outside of a sewer pipe is not trying hard enough. Rub the cap on your shirt too. To find lead, collect water from the sediment clean out tap* on water heater. Act horrified when sediment comes out. *Virtually every water heater manufacturer advises: It is recommended that the tank be drained and flushed every 6 months to remove sediment which may buildup during operation. When you don’t do this regularly, here is what can buildup in almost any water heater across the U.S. depending on water quality, hardness, temperature settings, etc. WATER DEFENSE Step 7: Re-establish your team’s scientific credibility and incredible powers of observation … comment on the water that comes from the sediment clean out tap. Claim you are using EPA’s grab sampling method*, but violate it in ways that create falsely high lead (e.g., collect water from three valves that have high lead because they are not designed to dispense water for consumption, use infrequently used taps, etc.). Oh, and, don’t be scared just yet! That will come later when we give the invalid results to consumers! Send the improper samples to an independent lab who has no idea how you collected the samples! The *independent* is key! Now use the printouts from the “independent certified lab” to reveal all the “bacterias,” “bacterial-fungi,” lead, and other chemicals that no one else finds. Don’t ever mention to consumers that if your sample collection methods are garbage and violate established protocols, that the results from an independent certified lab will be garbage too. Have in-depth discussions on primetime (oops, sorry online) and stage calls to frightened residents discussing the WATER DEFENSE test results. Mention similarities to Flint. Ingratiate yourself with unsuspecting residents with real problems who unfortunately trust your shoddy sampling! 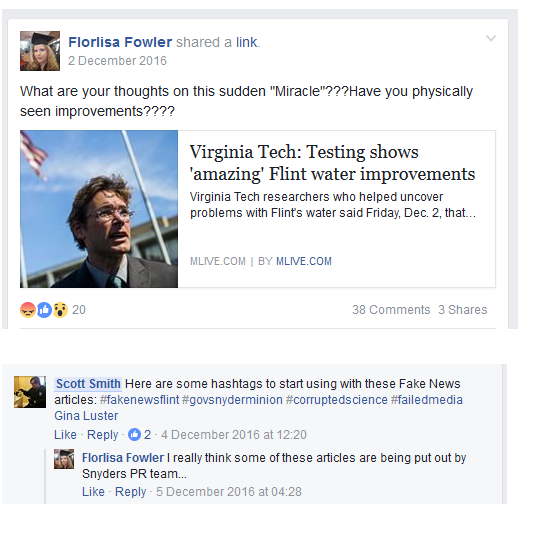 Throw tantrums by calling legit scientists who uncovered the Flint crisis “plebes,” “detractors” and bought off by the State/EPA, label the media as “fake” and claim your work has actually “empowered” residents when all evidence is to the contrary. Advertise your humanitarian mission and falsified sample results with tweets. Get Ruffalo to endorse your work on national media by stating “We are citizen scientists” and tweet results from an illegitimately collected water sample giving “citizen science” a bad reputation. To be clear, there are serious lead-in-soil and lead-in-water issues that consumers in East Chicago, IN have been grappling with for many years. But the EPA R5 (after Susan Hedman resigned) rightly deserves much of the credit for exposing this issue. Three weeks after our post praising EPA’s efforts in East Chicago, Water Defense came to do their testing, just like they came to Flint a month after the Federal Emergency was declared (and 5 months after the disaster was first exposed). Water Defense endorses sloppy tests done with a kitchen knife and is not embarrassed by “testing” using their now discredited sponge. In one video they use one sampling bottle to collect water from three different outlets (all of which are not intended for drinking water, by the way), and virtually everything they do is a case study in how to not conduct legitimate sampling as per EPA or Standard Method protocols. The mountains of useless and confusing data tend to obscure their unscientific sampling methods. They also claim it is about the “integrity of data at trial” (i.e., in court), but when you endorse sampling with a kitchen knife and a used water bottle and unsanitary and illegal methods, will a judge or jury really listen? Mark Ruffalo should be ashamed of his unscientific fear-mongering, which is causing residents unnecessary psychological trauma, undermining serious government relief efforts, and causing some residents to waste thousands of dollars on unnecessary filters to remove contaminants that are not even present in their drinking water. Curious about the right way to sample drinking water and why that is the case? Check our FAQ from last week for a primer. Please compare and inform us about the time frame noted above to what MDEQ sampling does…that may not be w/in 24 hours. – Coliforms and E. Coli are chilled immediately and always analyzed within 30 hours. 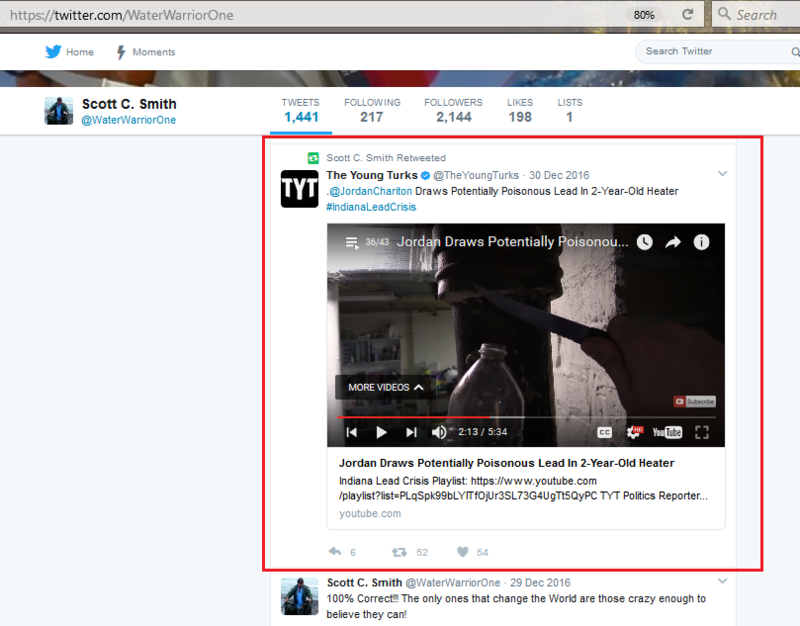 I grew up in blacksburg and during the election season I was a huge fan of TYT and Jordan Chairton. I just want to express how disgusted and ashamed I am of his behavior. i doubt you’ve kept up with Jordan’s….Jordan? But he briefly did his own “independent news network” that went by “truth against the machine”. Being a fan of his at the time I applied to the position to be a reporter and was accepted. I stated early on one of my main focuses was going to be the VT anniversary this past April. At the time it seemed like short staff, Jordan was busy with other things or whatever but his current actions speak for themselves. I was disappointed by the final post about the VT anniversary as I am upset by Jordan’s disrespect and complete disregard for reason. I took him seriously as a reporter out in the field and I regret that I supported someone so immature and just plain mean. Agree with Allison here on thanks for these. I’ve watched about half of the videos, they are hysterical! Much better than network reality shows; one simply couldn’t make this stuff up! !